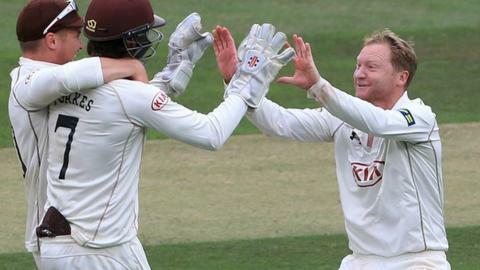 Surrey captain Gareth Batty is excited to see what his young squad can achieve in the County Championship's top flight after their Division Two title win. The Brown Caps finished 10 points clear of Lancashire after drawing their final match of the season against Northants. "These guys can be around for a very long time and hopefully the trophy cabinet will be brimming in the coming years," Batty told BBC London 94.9. "It will be tough [in Division One] but the group is moving forward quickly." Six of the Surrey team that secured a first piece of silverware since winning the CB40 competition in 2011 - Curran brothers Sam and Tom, Matt Dunn, Jason Roy, Ben Foakes and Rory Burns - are 25 or under. Batty paid tribute to the role the coaching staff has played in their development, led by director of cricket Alec Stewart and head coach Graham Ford. He added: "The coaching structure is perfect. You can see the young players, and older ones, are thriving. It's a wonderful environment and a credit to all those people. "We will enjoy the next 48 hours but we will quickly turn to getting ready for next year."